Practice theories of our equipped and situated tacit construction of participatory narrative meaning are evident in multiple disciplines from architectural to communication study, consumer, marketing and media research, organisational, psychological and social insight. Their hermeneutic focus is on customarily little reflected upon, recurrent but required, practices of embodied, habituated knowing how—from choosing ‘flaw-free’ fruit in a market to celebrating Chinese New Year Reunion Dining, caring for patients to social media ‘voice’. In ready-to-hand practices, we attend to the purpose and not to the process, to the goal rather than its generating. Yet familiar practices both presume and put in place fundamental understanding. Listening to Asian and Western consumers reflecting—not only subsequent to but also within practices—this book considers activity emplacing core perceptions from a liminal moment in a massive mall to health psychology research. Institutions configure practices-in-practices cohering or conflicting within their material horizons and space accessible to social analysis. 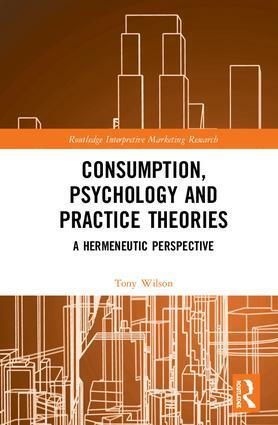 Consumption, Psychology and Practice Theories: A Hermeneutic Perspective addresses academics and researchers in communication studies, marketing, psychology and social theory, as well as university methodology courses, recognising philosophy guides a discipline’s investigative insight. Tony Wilson is a Visiting Senior Research Fellow at the London School of Economics and Political Science, Department of Media and Communications and a member of IAMCR.